Dental care is an essential component in the comprehensive treatment for a cancer patient. 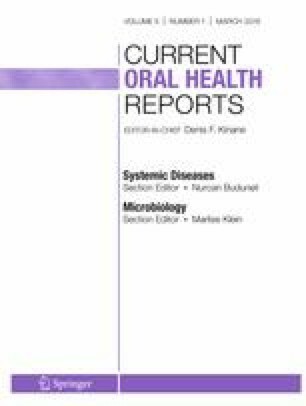 As such, a review of the literature was completed to determine the relationships between periodontal and dental care in the cancer patient and provide strategic suggestions. Periodontal treatment must be personalized depending on the patient’s current oral health status, systemic status, and progress in treatment. Oral mucositis, periodontal status, and osteonecrosis of the jaw (ONJ) remain periodontal concerns in providing dental care to the cancer patient. Risk factors for development of ONJ include root amputation (OR = 6.64), extraction of a single tooth (OR = 3.7), severe tooth mobility (OR = 3.60), and unclosed wound (OR = 2.51). Preventive maintenance, oral hygiene instruction, use of fluoride and chlorhexidine are all important therapeutic strategies. If extractions are required in patients who have received bone-modifying drug infusions, flap management and primary wound closure are needed to reduce the risk of complications. Direct funding was provided by the NIH/NCI PO1-CA093900, the NIH/NCI Tumor Microenvironment Network U54-CA163124 and supplement, Department of Defense W81XWH-14-1-0403, and NIH/NIDCR DE027551 (NJD).